I am SUPER excited how these cupcakes turned out. Other than Orange Crush I also love Mountain Dew. I wanted to try a new frosting technique as well I have read about. Since the only people eating these were my family – I was less nervous to try new things. Once I mixed up the batter (recipe at the end of this post). I like to use an ice cream scoop to get the same amount of batter in my cupcakes. 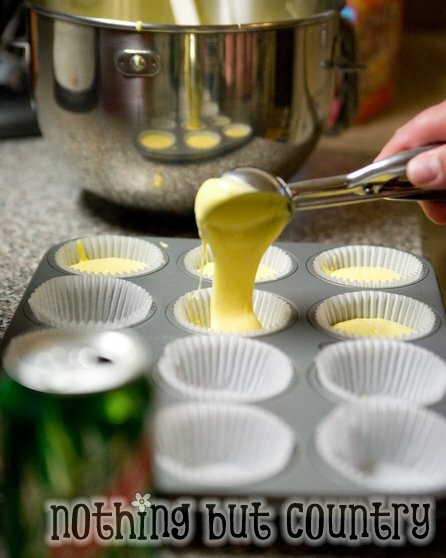 My cupcakes using this method in my convection oven bake in 13 minutes even. 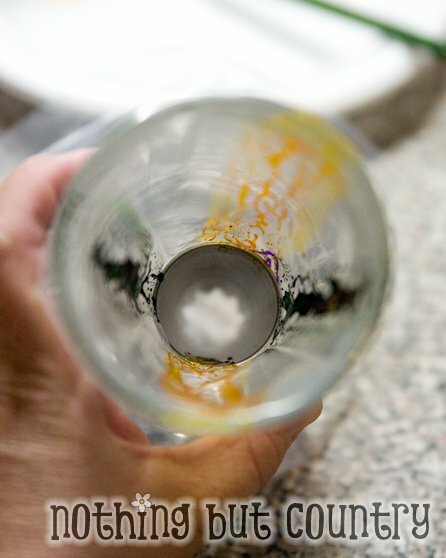 I put my frosting tip into my frosting bag and stood it up inside of a glass to help support it. I used green and yellow coloring gels. These are my favorite ever!! 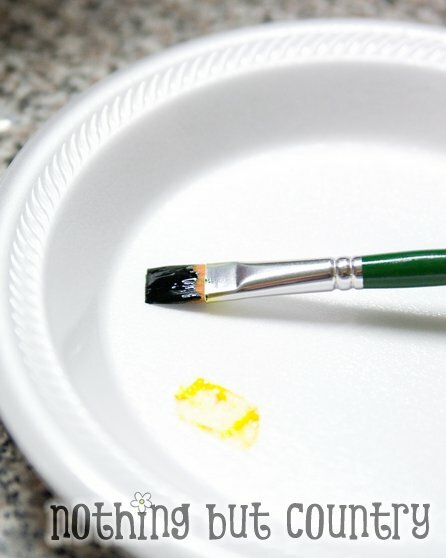 Using a brand new clean brush- I painted stripes into my frosting bag. 2 green 2 yellow then added my frosting into the bag. Here is a quick view of it filled with frosting. As it comes out it will pick up the colors off the bag. I frosted my cupcakes as usual and they came out looking really nice. Just the perfect touch for my Mt. 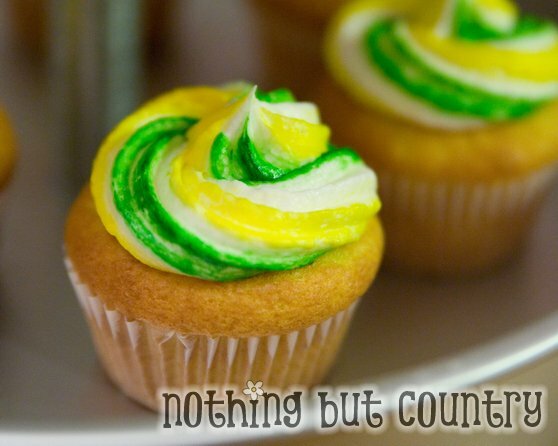 Dew cupcakes. They tasted as good as they looked. This recipe is super easy. Mix cake mix, pudding and eggs well. 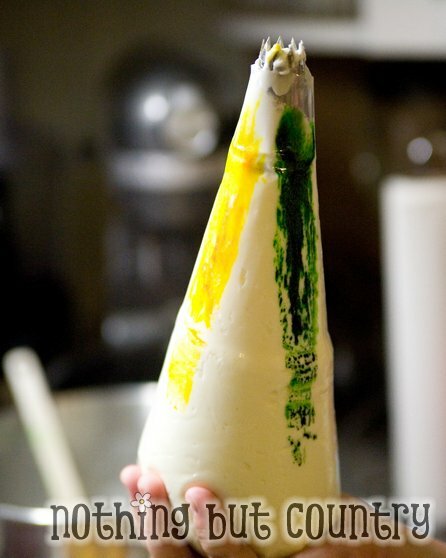 Add in your oil to the batter and mix for 2 minutes. Slowly pour in your mountain dew soda and mix for another minute. Allow time to cool before frosting. Beat your butter well till smooth, slowly add in 1 cup at a time of confectioners sugar and your lemon juice & mountain dew. Add all of your sugar and check for thickness of the frosting. 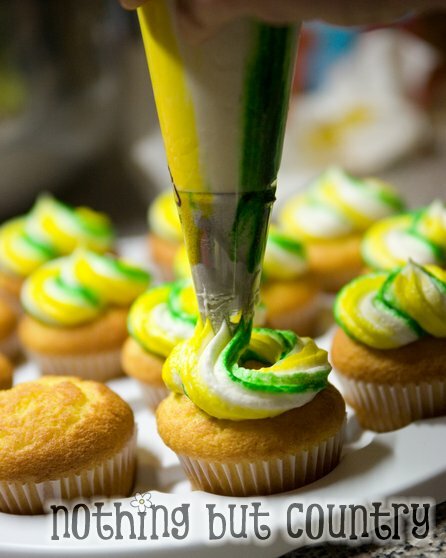 If it is too thick add a teaspoon at a time of mountain dew till you reach the correct consistency to pipe or frost your cupcakes. Oh my gosh, how fun is that? My husband would love them. He’s a chocoholic but he adores Mountain Dew. Those look almost too good to eat! These cupcakes look delicious! Thanks for sharing the pictures of the preparation and the recipe. I printed the recipe and pinned it on my pinterest! BTW, just wanted to let you know, I love, love your blog! I enjoy it so much! Thank you for taking your time to do this blog! It’s wonderful! 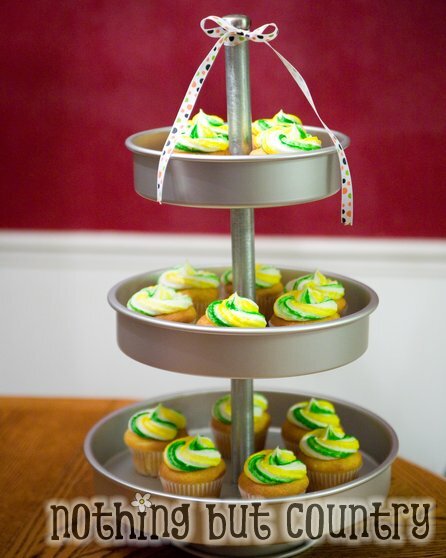 Mountain Dew Cupcakes! Wow, these sound like something I have got to try. I love how your frosting turned out! Goodness gracious, I love you for posting this! My Mother In Law is a Mt. Dew FREAK.. I am so making these for her Birthday. Thanks for sharing! Hi guys! Stopped by from Tip Junkie because my hubby is a HUGE Mountain Dew fan and these sound amazing! I would love for you to share them (and any other cupcake related posts – old or new!) at our Month Long Cupcake Party! My husband LOVES Mt. Dew. See this post for proof (http://btanders.blogspot.com/2011/05/pop-candy-or-should-it-be-candy-pop.html). I will definitely be making these for his birthday next year. Thanks for sharing! I LOVE your blog! What beautiful cupcakes! I would love it if you came over to my party “Cast Party Wednesday” tomorrow and shared some of your recipes with us. Thank you so much for sharing this recipe! I made these cupcakes this past weekend for my husband’s birthday. We went to his parents’ home for his “birthday dinner”, and they were a hit with his entire family. Thanks again!! I will be definitely making them over, and over, and over, etc. They tasted amazingggg! and like mountain dew great recipe! What size pudding?? Large or small?? Do you make the pudding and add the pudding to the batter or just add the pudding mix powder to the batter? Pam sorry I use a large box of pudding. My husband turns 35 on Wednesday and I am so making these for him. He is a Mt. Dew addict. He literally drinks a case a week! I looked at a lot of other recipes but this seemed to be the most simple and easy to follow. Not to mention pretty! I made these and they turned out very tasty. I screwed up the icing, but I’m attempting these cupcakes again tomorrow. I was wondering, what is the point of the lemon pudding mix? Is it added for texture? Lastly, I was thinking if only Pop Rocks made a lemon or lime flavor! 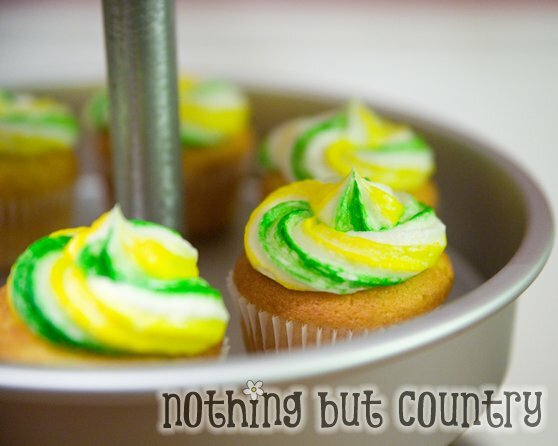 Sprinkling them on the top of the icing at the last minute before serving would be awesome! Would totally give it that fizzy, poppy, soda feel. Thank you so much for the idea, my boyfriend loved them on his birthday! Can you use diet mtn dew..? What size box of pudding?? As a topping I am using crushed nacho cheese doritos! Do you make the pudding first or add it all together? I made them and they taste amazing!!!!!! This is a great recipe, however, when i tried to make it i didn’t really think about the altitude differences… Do you have any ideas about what could be done to correct for high altitude? The cupcakes came out flat. but they still tasted good. Instant pudding comes in 2 sizes, do I want the large box or the small one? This isn’t your original recipe, this is a tweaked recipe that you found. I am sorry you are wrong sir. This is my recipe. I often take cake mixes and different flavorings and substitutes. 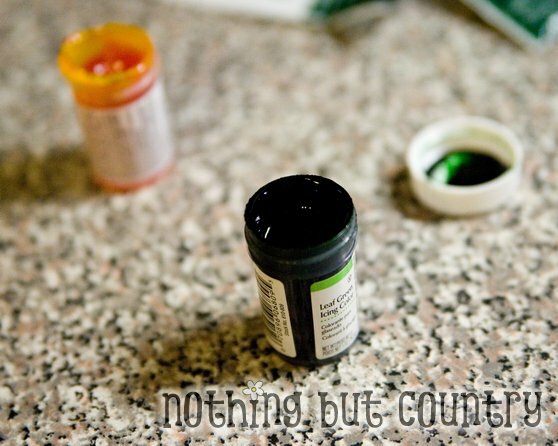 It is fairly easy to change up pudding mixes and substitute liquids for other liquids. I won’t be the first person nor the last to do this, I simply blogged the recipe that I personally made for my family and friends and shared it on my blog for people that are just now starting to learn or venture out in substitutions with cake mixes. But thanks for your opinion, even if you are wrong. Would cook and serve pudding mix work? They didnt have lemon flavored INSTANT at the two markets I tried. Thanks for your input! do I make the cake mix or just add right in??? Do you make the cake mix?